Just a quick reminder for those in the UK about this weekend’s medieval/Tudor themed viewing. Tonight you can see the final episode of Ian Mortimer’s Time Traveller’s Guide to Elizabethan England and then on Sunday it’s The White Queen! 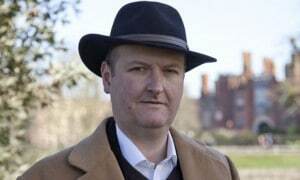 “In the final episode of the series, Dr Ian Mortimer travels through the world of a new and upwardly mobile section of Elizabethan society – the middle class. In a groundbreaking new way of exploring history, Ian takes viewers on a present-tense journey through this golden age of English history. Along the way he visits Stratford-Upon-Avon and reveals how urbanisation improves ordinary people’s lives. He drops in at Shakespeare’s school to uncover how education transforms society and explores how this age of discovery helps spur a scientific revolution that creates a new world. I grew up near Stratford-upon-Avon, so I’m going to enjoy this one! If someone puts it on YouTube then I will add the link to The Anne Boleyn Files Facebook page for those of you in other countries to view. The BBC adaptation of Philippa Gregory’s “The White Queen” starts on Sunday night at 9pm on BBC1. 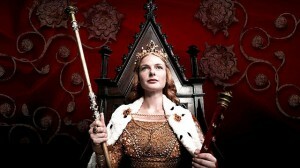 The website says of episode 1 “After meeting Elizabeth Woodville, King Edward IV must choose between love and loyalty.” See http://www.bbc.co.uk/programmes/p018sxqp for more information. Those of you in the USA who have the Starz channel will be able to watch The White Queen in August, see http://www.starz.com/originals/thewhitequeen. I’ve read that they were blond and in Edward’s portrait he certainly looks fairer than Richard III, but I wonder if that difference may not have been exaggerated over the centuries to provide an interesting contrast (rather like how Anne Boleyn is always The Dark One and Mary the Blonde One even though the supposed portrait of her makes her look like she just has somewhat lighter brown hair). I do notice that none of the men seem to have that Plantagenet bobbed haircut — Richard comes the closest but even his is artfully tousled. True, it’s not a terribly flattering cut to modern eyes, but it would have been nice to see them at least try to style the hair as they would have. Dee, do some checking on the ‘net. I found it with no problem. It is awesome! It was from this lot Edward IV and his Queen Elizabeth Woodville, that Henry VIII got his strong good looks, his fair reddish hair, his tall height and his temperament. When I say his temperament I mean the gracious demeanour that he had as a charming young man. He may even have gotton his love of sports and many of his skills from them. I do not know if desire for the ladies is also inherited: but Edward Plantagenet had a roaming eye. Not only had he previously betrothed himself to Eleanor Butler and then forgot to undo it when he married Elizabeth Woodville, with whom he fell madly in love, but he was constantly unfaithful to her, far more than Henry VIII was. This is a very turbulent time in English and Welsh history and the crown changed hands four or five times from 1461-1485, before being taken over at Bosworth by Henry Tudor. But it also seems to have been a time that was dominated by just a few very large and very powerful noble families and very passionate and strong women. It is the ambitions of those women for their families and their men that drove the dynamics of the Cousins War. Now we are going to meet them all in a widely anticipated new drama: which I must say looks not too bad. Philippa Gregory has done well here, but the dialogue could be a bit better. The Neville Clan should come through with a great flourish and I hope that they are all shown to be dynamic and strong individuals who shaped the destiny of a nation, but sadly the fall of a dynasty. I am looking forward to this tonight. However, will be watching on record as it clashes with the finale of H50! I’m sure it may be entertaining on one level but I can’t really face another Philippa Gregory filtering of a female historical character into a bad woman stereotype – this time a witch. I feel Elizabeth Woodville gets something of a rough deal from many writers (particularly those sympathetic to Richard III – in fact, she’s usually the one whose character is blackened in order to make Richard seem better). She lived in a very turbulent time, saw many family members and children have their lives cut short and had to engage in some realpolitik when under considerable threat. The fact that she managed to negotiate her way through and survive is no mean achievement. Like Anne Boleyn, she came from a background that meant she should never have been queen – the fact that she did so made some people search around for a reason, however fantastical, like it being a result of sorcery. As far as I’m aware, although it’s an article of faith among some Ricardians as it would ‘justify’ Richard III’s usurpation, there’s also no proof of there being a precontract between Edward IV and Eleanor Butler. It’s another ‘rumour’ that keeps getting raised to imply that Elizabeth Woodville was undeserving of the title of queen. The White Queen was excellent, but for one or two historical errors that are part of the charm of these books; the drama is close to the book and very well played. I would say one thing though: I know that Jacquetta was a witch and was very into this, but I am not familiar with Elizabeth having claimed to have had second sight or being accused of witchcraft. I know this is most likely Philippa Gregory taking a theory and running with it: but I am sure that Elizabeth was never really connected to witchcraft. She was probably accused of a lot of stuff and no doubt dabling in the dark arts was mixed up with those things< but Jacquetta was actually denounced as a witch. She was in fact lucky not to have been burnt or hung so strong was her link to it. The drama has Elizabeth having visions of the future. I would take this with a pinch of salt. Having said all this the drama was well played; the women are strong and defiant; the men actually seem a little on the weak side; and Duchess Cecilly sitting enthroned and utterly denouncing the whole affair was excellent. Costumes are supperb and the entire drama is very well played. Great: cannot wait for the next episode. Jacquetta was not a witch either, she was acquitted of the charges against her. We have to remember that the charges were brought against her when Warwick was trying to bring down the Woodvilles. She was exonerated and there is no evidence that she practised witchcraft or claimed to have “the sight”. Thank you for that information, Claire. The charges were obviously brought by those who did not like the fact that she was a strong and wealthy woman. I can cope with the idea of Jacquetta having the sight but the witchcraft stuff sounds more like 15th century attempts at vilification. I have seen the article, found it very helpful; need to read it again though as it was well after midnight by the time I saw it. Did Richard III also not attempt to revise the witchcraft stuff and denounce one of these ladies? If so he has motive as he is trying to set aside his brother’s sons claims. Well, I suppose it all makes good drama: and it takes nothing away from how good the actual drama seems to be. It was still well acted, and I am not bothered if the actors had black hair or fair: if they act the part well; that is what I find the most important. Just dug out Eleanor The Secret Queen by John Ashdown Hill and my two bios of Elizabeth: intrigued about Edward’s former relationship with Eleanor and of it actually happened. A question was raised on an on-line article of this as if Eleanor had have been jilted by Edward she had powerful family to turn to for justice. Had Edward got her with child he would have had to do good by her child! Had he promised her marriage, surely her family would have insisted he either honour this or dissolve the marriage so as he was free to wed Elizabeth? I know one thing Edward IV was a little carefree and even careless when it came to women. He had several affairs when he married Elizabeth and before hand and at least one illigitimate son that we know off as he was famous: Author Planragenet, Lord Lisle. P.S The marriage to Elizabeth was in secret or private, which is fine as long as there are two witnesses and the couple agree to live as man and wife and then consumate the marriage they are wed. But before Edward met her, he had contracted with Eleanor Talbot, Lady Butler. She was of higher birth and would have made a more suitalble wife but for some reason Edward did not seal the deal. He and Eleanor are said to have been promised and to have consumated the agreement. This was not broken and so canon law says they are technically as if they were married: not married but not free to marry anyone else either. Now in the drama Anthony Grey; next Earl Rivers, Elizabeth’s brother tried to warn her that Edward had married someone else and that this lady had born his son. Assuming this lady is Eleanor Talbot Butler, I have never read that she had a child by Edward. I have read that she may or may not have been his secret Queen and his wife. It was that he was married to her that Richard III had the marriage between his brother Edward and Elizabeth Woodville declared null and void and there kids bastards. He then of course could clear the way to become King. So I have a question. Is there any evidence that he really was contracted to this Eleanor and did she have his son or is the addition of a son a dramatic license by Philippa Gregory? After Edward’s death, Richard III claimed that his brother had been pre-contracted to Lady Eleanor Butler and used this as the excuse to void his marriage to Elizabeth and label their children as illegitimate, as you said. On 22nd June 1483, a clergyman named Dr. Sha preached a sermon outside St. Paul’s Cathedral in which he claimed that Edward had been pre-contracted to Eleanor and that she had had a child by him. This was confirmed by Robert Stillington, Bishop of Bath and Wells. There may have been some truth in the story, but since Eleanor had been dead for many years, along with any child that she may have borne, a good case could be made for Edward and Elizabeth being married ‘by habit and repute’ under canon law, which would have made their children legitimate. So this isn’t an example of Ms. Gregory’s dramatic license, but is based on a real, if somewhat shaky, claim made at the behest of Richard III. I enjoyed ‘The White Queen’, especially the performance of Janet McTeer as Lady Rivers, but there were some annoying moments. I don’t know why Bona was described as a French princess when she was from Savoy, let alone why she pitched up at the English Court whilst negotiations for a marriage to Edward were still ongoing. Some of the costumes were a bit strange as well, particularly the weird tie-dyed crushed velvet number that Elizabeth wore at her wedding. And there was a curious lack of hats in an age when a woman who left her hair uncovered in public would have been seen as a slapper. Maybe Elizabeth was supposed to be signaling her availability when she met Edward sans hat or veil, but the upright Lady Margaret Beaufort would never have been seen thus! According to Victorian historian James Gairdner (a staunch More/Shakespeare traditionalist), the alleged pre-contract wasn’t widely accepted. He also said that the main reason for believing the story was not just a political convenience was Henry VII’s attempts to suppress it (he ordered it destroyed, with no one allowed to read it, and in giving out the story, had Richard claiming that Edward was pre-contracted to a different woman, Elizabeth Lucy, who denied it. So, you have Henry VII giving Richard a stronger claim to the throne than Richard gave Richard! I think that it was Thomas More who claimed that the lady named in Titulus Regius, (the Act passed by Parliament in 1484 which declared Edward’s marriage to Elizabeth Woodville invalid) was Elizabeth Lucy. More was unable to check this because all copies had apparently been destroyed. However, the Elizabethan writer George Buck found a surviving copy and was able to verify that the lady named in it was in fact Eleanor Butler. Henry VII repealed and destroyed Titulus Regius in order to show Richard III as a usurper and to strengthen his wife Elizabeth’s claims as Edward’s eldest daughter, which would in turn pass to their children. There was a story that Elizabeth Lucy was asked to confirm at some point that she had not been pre-contracted to Edward, which she duly did. Eleanor Butler died in 1468, and it is not known whether she was asked the same question at any time prior to her death. She does not appear to have raised any objection to Edward’s marriage to Elizabeth, which has been interpreted as a sign that there was no pre-contract. It may be that Edward had made some vague promises to marry Eleanor in order to sleep with her, but without independent witnesses, it would have been her word against his. In these circumstances, it would have been foolish of her to risk losing the King’s favour and the lands that he had restored to her by staking a claim to marriage. Regarding the witchcraft charges against Jacquetta, I also tend to believe that these were probably fabricated by the Earl of Warwick (and later revived by Richard III). Nonetheless, in fairness, one should point out that just as the charges occurred during a period when Warwick was in political ascendancy and were clearly politically motivated, the acquittal took place after Edward IV and the Woodvilles had recovered power and was thus likewise politically predetermined. Neither the accusation nor the acquittal would have been based on either side caring about anything as trivial as evidence ! It’s also possibly worth noting that the witch-hunting mania doesn’t really get started on the Continent until the publication of The Hammer of Witches in 1486, and doesn’t take off in Britain until King James VI of Scotland starts to become obsessed with the subject in the 1590s. Prior to that, there were a handful of executions for witchcraft in Britain in the fifteenth and sixteenth centuries, but it’s pretty rare. “White magic” (consulting astrologers, fortune-telling, healing charms etc) was therefore not all that uncommon in fifteenth century England, even among the aristocracy. So it is just conceivable that Jacquetta might have tried her hand at a little fortune-telling and the Earl of Warwick simply inflated this and spun it as something more sinister. It’s also, of course, perfectly conceivable that Warwick simply invented the whole story completely. There’s no real evidence either way. Incidentally, the part about Jacquetta and her daughter Elizabeth claiming descent from the fairy Melusina IS historically accurate (as indeed did the Plantagenets via their distant ancestors the Counts of Anjou). This does not, of course, mean that either family were claiming to themselves possess supernatural powers – it was (in both cases) a long-standing family legend intended (presumably) to enhance the prestige of the family. And that family legend, and how openly the Woodvilles celebrated it, may have been what gave Warwick the idea of accusing Jacquetta herself of witchcraft. Yes, Bona was Louis XI’s sister-in-law, which certainly made her a French ally, although not a French princess. Warwick apparently first enquired about Louis’s daughter Anne as a possible bride for Edward, but the idea was a non-starter because of her age – she was only three. Anne grew up to be a formidable politician who served as regent for her younger brother and described by her father as ‘the least silly woman in France’. An alternative potential bride was another formidable and powerful woman, Isabella of Castile, who was later the subject of negotiations on behalf of Edward’s younger brother Richard. All the action in the opening episode of “White Queen was set in Spring 1464, at which time Lady Margaret Beaufort was 21, a year younger than Edward IV, George Duke of Clarence ws 14, Richard Duke of Gloucester was 11 and the two Neville girls were 10 and nearly 8. Cecily Neville was 49 but will have looked older than a modern 49-year-old. Makes it hard to take it in the spirit in which it is meant. I really enjoyed “The Time Travellers” shows and found all four on you tube. A very nice surprise and found each episode quite informative. I also found the first part of the “White Queen” series on you tube and was not very impressed with it. Kind of like watching the same mistakes that were in “The Tudors” again. Everyone looks like a model and should be doing a commercial for a cosmetic’s company, especially Elizabeth and Edward. The costumes and lack of hats makes it seem like a print advertisement from an enchanted land and not a real part of history. Then you have the witchcraft thrown in and it really seems fake. If the show started with “once upon a time” it would not surprise me. Been trying to find a book on Jaquetta but can only find her in the books of the period like the Cousins Wars and Blood Sisters. I cannot find a biography old or new. What a shame as she seems a fascinating woman. I know that she was meant to be connected to superstitious practices and was accused of witchcraft. Ultimately nothing was found against her and she was clearned, but it is her strength of character and backing of Elizabeth that I found admiring in the books and the drama. Now she has lost a son and her husband to Warwick’s ambition and they were cruelly beheaded by him even though he did not have any authority. It must have been hard for the women of these two royalist families as they are continuing to be in danger if one king or another gets the upper hand. I really felt for Jaquetta in this weeks episode and for poor Elizabeth: having to escape again and this will not be the first or the last time she will have to take her children into shelter. I do have one question: What is the obsession with all of this witching stuff? I was almost expecting Morgan Le Fay to come around the corner when she wrote the names of her enemies and put them into the flames. They really have taken this theme and run with it! I can understand Margaret of Anjou’s vision of Henry Tudor (aged 6) becoming King as he was called the Sun of Prophecy and this was a good way to dramatise it, but the magic stuff is too much!